Landscape painting is rare in Spanish art. This scarcity can be tied to Spanish history. The Spanish Counter-Reformation of the sixteenth century was staunchly against both classicism and humanism. Strictly interpreted Catholic doctrine viewed the subject of human nature and nature in general as corrupt and indulgent. To contemplate the beauty of nature was to indulge in a hedonistic, pagan, and heretical act. As a result, a variation on landscape painting emerged. During the second half of the sixteenth century, when El Greco came to live in Spain, a mystical and poetic current swept the nation. Instead of picturing the land as lush and inviting, artists used landscape as the setting for sacred events. In El Greco's landscapes, we can see this "fire" or passion. His nervous, tormented, mystical, and visionary approach to painting not only expressed the intellectual climate of his age, but centuries later it would also become a model for the next generation of Spanish painters, including Francisco Goya, Pablo Picasso, Salvador Dali, and Joan Miro. 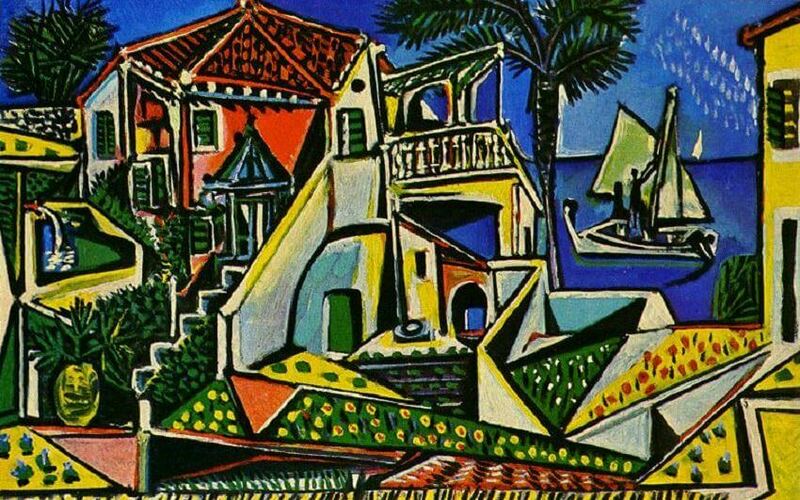 This particular piece was finished in 1952, after Picasso's cubism style was developed. The choppy shapes remind viewers of a collage, or synthetic cubism. Synthetic cubism is the use of cut paper fragments, wallpaper or newspaper, pasted into the composition. This style was developed along with Georges Braque and it analyzed objects by their shape.